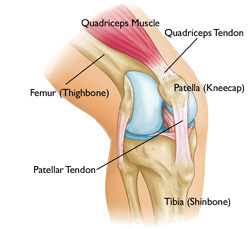 If your quadriceps tendon is ripped from bone, you are very likely to get quadriceps tendon tear. The normal activity of the quadriceps tendon is to work together with the frontal thigh muscles to straighten your leg. Slight tearing in the quadriceps tendon leads to difficulty in using your leg and a substantial tear will disable your leg and require surgery followed by physical therapy to repair. Quads ripped from bone are not common injuries and usually occur in older people engaged in sports involving jumping or running. What Causes Quadriceps to Rip From Bone? In case of a small or partial tear, nonsurgical treatment will suffice. Rest: Avoid activities that may aggravate the tendon injury for the period when the symptoms remain. Ice: Application of an ice pack to the injury region reduces the swelling and pain. Compression: Wrap the knee with bandages when necessary. Elevation: Keeping the leg in an elevated position reduces the swelling. Use NSAIDs (Nonsteroidal anti-inflammatory drugs) such as naproxen and ibuprofen to relieve pain. Immobilizing involves wearing a brace to keep your knee straight and avoid movement. Your doctor will usually recommend that you use knee braces or immobilizers for three to six weeks. During this time, you will most probably need crutches to keep your body weight off your injured leg. Physical therapy will commence when the initial swelling and pain subside. This will involve exercises designed to restore strength and get the leg back to action. As you progress in your physical therapy, your therapist will incorporate more exercises to strengthen the injured quadriceps. Thereafter, your braces will be unlocked to allow you to move your legs in an increasing range of motions. You will progressively be assigned exercises until you and your doctor are certain that you are ready to get back to normal sports. In case you have serious quads ripped from bone, you will need surgery to fix the tendon. The decision for a surgery will be made on the evaluation of your overall condition. During the surgical procedure, the torn tendon is reattached to the upper part of the kneecap. It is worth noting that best results are achieved when surgical intervention is carried out as soon as possible following injury. This reduces chances of scarring which would lead to shortening of the tendon. While surgical treatment may be performed on outpatient basis, in most cases it is necessary for the patient to spend a night in hospital following the procedure to allow for observation. Get crutches and use them for weight bearing as tolerated (WBAT) whenever you move. Wear a dial brace and lock it at all times except during therapeutic exercises. Stick to the recommended range of motion. Maintain dryness on the incision site and the sutures. Keep within 0°-30° of passive range of motion (ROM) unless your therapist advises otherwise. Continue using crutches, gradually allowing for weight progression and sticking to wearing the dial brace and keeping it locked except during therapeutic exercises. Your surgeon may alter these precautions and ROM limits depending on the status of recovery. Gradually progress on weight bearing using knee flexion but avoid going beyond 70° within 12 weeks following surgery. Keep within the recommended ROM below. Always warm up before serious exercises. Improve the flexibility of your tendons by doing some stretches prior to engaging in sports activities. Get sufficient recovery time between routines. If you play sports such as football and basketball, wear the recommended safety equipment properly so as to support your knees. Ensure that you keep fit so that your quadriceps tendons remain flexible, strong and enduring. Get treatment for any recurring problems that may expose you to tendon injuries.